James Hoban (c. 1758 – December 8, 1831) was an Irish architect, best known for designing the White House in Washington, D.C. He excelled in his studies and received the prestigious Duke of Leinster's medal for drawings of "Brackets, Stairs, and Roofs." from the Dublin Society in 1780. Later Hoban found a position as an apprentice to the headmaster of the Dublin Society School the Cork-born architect Thomas Ivory from 1759 to 1785 . Following the American Revolutionary War, Hoban immigrated to the United States, and established himself as an architect in Philadelphia in 1785. Hoban was in South Carolina by April 1787, where he designed numerous buildings including the Charleston County Courthouse (1790–92), built on the ruins of the former South Carolina Statehouse (1753, burned 1788). President Washington admired Hoban's work on his Southern Tour, may have met with him in Charleston in May 1791, and summoned the architect to Philadelphia, Pennsylvania (the temporary national capital) in June 1792. 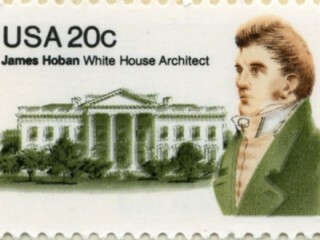 In July 1792, Hoban was named winner of the design competition for the White House. His initial design seems to have had a 3-story facade, 9 bays across (like the Charleston courthouse). Under Washington's influence, Hoban amended this to a 2-story facade, 11 bays across, and, at Washington's insistence, the whole presidential mansion was faced with stone. It is unclear whether any of Hoban's surviving drawings are actually from the competition. Hoban was also one of the supervising architects who served on the Capitol, carrying out the design of Dr. William Thornton. Hoban lived the rest of his life in Washington, D.C., where he worked on other public buildings and government projects, including roads and bridges. He also designed Rossenarra House near the village of Kilmoganny in Kilkenny, Ireland in 1824. Hoban's wife Susanna Sewall was the daughter of the prominent Georgetown "City Tavern" proprietor. Hoban was also involved in the development of Catholic institutions in the city, including Georgetown University (where his son was a member of the Jesuit community), St. Patrick's Parish, and the Visitation Convent founded by another Kilkenny native, Teresa Lalor of Ballyragget. Hoban died in Washington, D.C. on December 8, 1831. He is buried at historic Mount Olivet Cemetery in Washington, D.C.
Little has been published to catalogue Hoban's architectural work. Considering his stature as the architect of the White House, the number of his landmark buildings that have been lost is surprising. -Charleston County Courthouse, 82-86 Broad Street, Charleston, SC (1790–92). A likely model for the White House's main facade. -The White House, 1600 Pennsylvania Avenue, Washington, D.C. - (1792–1800). Following the 1814 burning of the White House, Hoban rebuilt the Southern Portico for President James Monroe (1824), and the Northern Portico for President Andrew Jackson (1829). Numerous events were held around 2008 to commemorate the 250th anniversary of his birth. In 2008, a memorial arbor to honor James Hoban was completed near his birth place, and a major exhibition on his life took take place at the White House Visitor Center. Dublin Made Him..., a one day colloquium in honour of Hoban, took place on October 3, 2008, at the (RDS) in Dublin, Ireland. It was presented by the RDS in association with the White House Historical Association, the U.S. Embassy in Ireland, and the James Hoban Societies of the U.S. and Ireland. The Irish-American group Solas have a song "John Riordan's Heels/The Bath Jig/Hoban's White House" on their album For Love and Laughter. Group member Mick McAuley, like Hoban, is from Kilkenny, and named the song in Hoban's honor.